The phenomenon of consciousness includes mysterious aspects providing a basis for many spiritual doctrines (including religions) and psychological practices. These directions of human knowledge are usually considered to contradict the laws of science. However, quantum mechanics - in a sense, the mysterious direction of science - allows us to include the phenomena of consciousness and life as well as the relevant phenomena in the sphere of science. Wolfgang Pauli, one of the pioneers of quantum mechanics, together with great psychologist Carl Gustav Jung, guessed about the relation between quantum mechanics and consciousness in the beginning of the twentieth century. 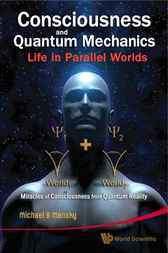 However, only many-worlds interpretation of quantum mechanics, proposed in 1957 by Hugh Everett III, gave the real basis for the systematic investigation of this relation. Roger Penrose, one of the apologists of the relation between quantum mechanics and consciousness, claimed in his last book "The Road to Reality" that the Everett's interpretation may be estimated only after creating the theory of consciousness.Thereagainst, the author has proposed in 2000 and further elaborates in this book, the so-called Extended Everett's Concept, that allows one to derive the main features of consciousness and super-consciousness (intuition, or direct vision of truth) from quantum mechanics. This is exposed in this book in a form intelligible for a wide audience.